Pretty Things: Another Giveaway -- Beads! I was approached recently by Auntie's Beads and asked if I'd like to choose a few beads and create with them and share my thoughts with you. This was my first experience with Auntie's Beads, and after looking through their web site, I chose an assortment of pewter beads and copper beads. My first pairing is copper-plated pewter with ceramic by Round Rabbit Extra. 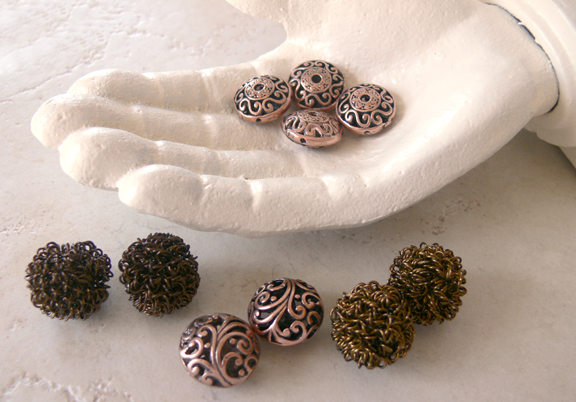 I quite like the design of the copper beads -- I've not seen them anywhere else. I decided to mix bright copper with the oxidized copper of the bead and the ear wire as a subtle contrast. 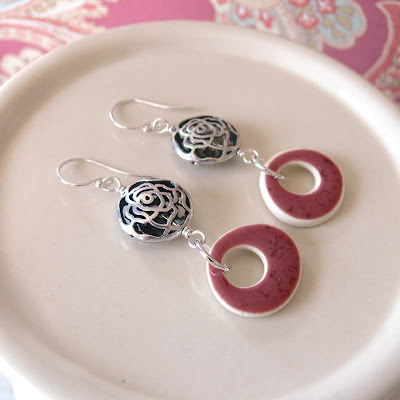 My next pairing is pewter with another set of ceramic beads, this time by Elaine Ray. Once again, I chose the silver beads based upon not having seen them before. After all -- isn't that what we're after? And what's cool is they don't cost an arm and a leg. I often will use pewter rather than sterling silver when I can find unique beads. My last creation is the one I'm most happy with, for several reasons. You know when you buy a bead and you have NO idea why, you just think it's cool as all get out? Most of them time, as soon as I see a bead, I know exactly what it will turn into, but sometimes, I run across these rogue beads that just sit there smugly and say, "Yo. Buy me." I've had this huge purple lucite bead for ages. It's a big bead, 1" in diameter, so that alone limited me. But when I chose a 1.5" tall copper-plated oval pendant, I had a "tah-dah!" moment. Using twisted copper knot rings as bead caps and bail, the large lucite bead nested well and made the perfect addition to the copper oval. To highlight the blue/violet of the bead, I used a deep purple satin cord as the necklace. What do you think? So here's the fun part -- I have beads to gift to one lucky winner! The beads in the hand can be strung either vertically or horizontally (a rather cool feature) and the twisted wire beads have a lot of possibilities for those who want to add texture to their work. 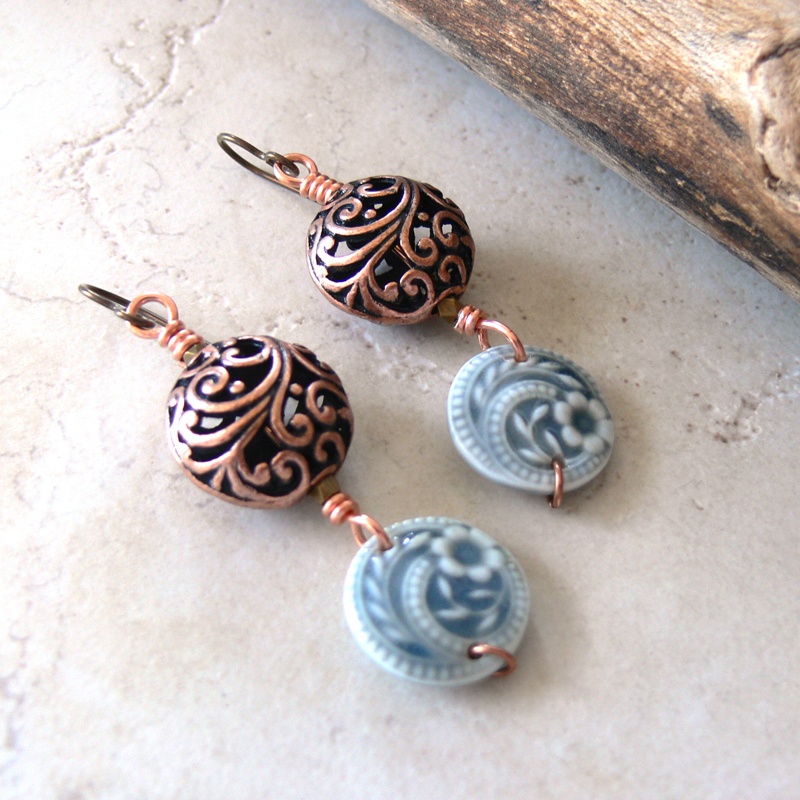 And the two copper-plated pewter beads in between are the same as the ones I used in the "Garden Grace" earrings. It's easy to win -- leave a comment. If you don't have a blog, leave an email so I contact you if you win. I'd love if you blogged about the contest, too! The contest winner will be announced Thursday, December 16th! Legal stuff -- As a reviewer of products at Auntie's Beads, I receive the beads above free of charge. I have been asked to review these products and give my honest opinion of the products...positive or negative. I am not being compensated by Auntie's Beads for my endorsement as it pertains to the products received and reviewed. thanks for sharing..your pieces are lovely. with silver prices increasing pewter seems a good way to keep prices reasonable. The copper pendant with the lucite bead is scrumptious. isn't it fun when you have that moment? The right bead, the right complementary beads, and the right clasp. Love it. I love those beads. I also loved all your creations. Thanks! You paired up these beads so well. I especially like how the porcelain and filigree bead play off each other. But you are right that last necklace is especially nice. All those little elements like the twisted rings add up to a really great design. I really like the garden grace earrings the beads go so well together. I absolutely adore the blue bead at the bottom of the earrings! Lori, Great earrings. Thanks for sharing! 'Tis the season! Great beads and great designs! Love the pendant you have created. Thanks for the giveaway. P.S. How generous of you to share your beads. oh these are pretty pieces! I will be sure to blog about the contest also! Thanks!!! Ooh! I do love those pewter beads. Pewter has gotten a bad rap it seems in favor of her flashier sister Sterling Silver. But I quite like the intricate designs and I am hardly a bead snob so I say bring it on! And with the rising cost of silver this is a great alternative. I love them. I was graced with the Auntie's Beads giveaway back in June and had a blast picking out something special. I will have to go back and check out these new offerings! Very fun, I also like what you did with your "big" bead! Your creations are fantastic! I really like your Garden Grace earrings. They are elegant, but could still be worn with jeans and look great! i'm moving in and i'll clean your house every week in exchange for jewelry lessons. i swear, girl, you are an amazing artist. Lovely finished pieces Lori!I really like the final piece and how it all came together. Great jewelry Lori! I love Auntie's Beads and shop with them a lot! These beads are some of my faves too, lots of impact without a lot of money! Wow, I just adore the garden grace earrings! Something about the copper and that blue, so beautiful. your creativity is just amazing....i love to come here and juuuuuust look around. "pink roses"? oh yeah...definitely my favorite!! They're all gorgeous! Love how you used bright and antique copper in those earrings! Well Lori, you have done it again, I am always excited to see what you are up to. I love the first set of earrings. I too have gone balistic over copper to me it is the new gold. Lori your pieces are wonderful! The beads you chose are unlike any that I've seen. I love the twisted wire beads. They look like little steel wool scouring pad. Ooo, la la! I hear you on choosing the pewter over sterling...prices keep going up and up! Very neat creations! I haven't looked at pewter much, but after seeing yours, I might have to check it out! the beads that can be strung in either direction are awesome! I am always wishing for that! I’m just starting out as a jewelry designer (two months in) and always find inspiration and tremendous beauty in your blog. Also, I really like my pewter beads. Thanks for the idea about the linked rings for helping a large bead nest well. Lori, love what you have created. I really like Blue violet. Beautiful combination of colors. Tx for the opportunity to be entered. I will also tweet your blog. I love how you put those all together. How fun and versatile those beads are. I am so in for this one! Now I have an idea for the twisted copper knot rings that just came from Auntie's! That was clever the way you used them horiz. and vertically too. The purple and violet , very nice. Thank you for the little show! Ooooooh nice beads! I love what you created with them. Especially that necklace. Simple but absolutely perfect. 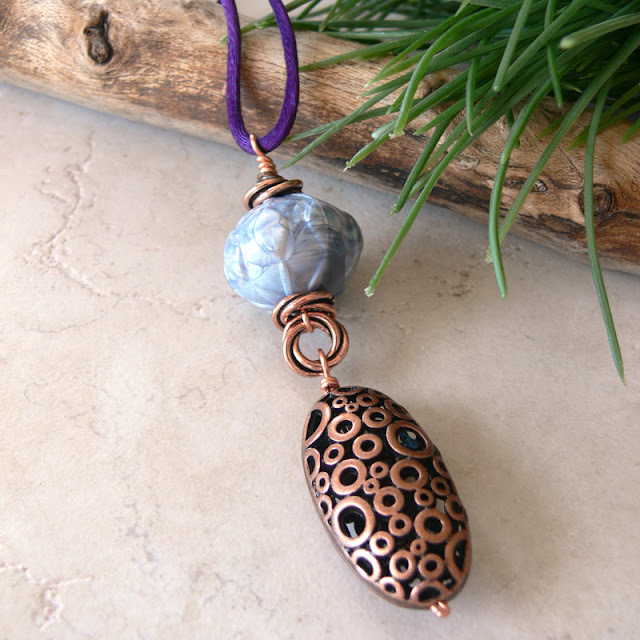 love your site and copper is my favorite metal...love the color and design of your beads! The large lucite bead with the copper is gorgeous! Fun to see what you've created! Would love the beads you are sharing! Thanks for the opportunity to try to win! I think pink roses is my fav- lovely beads. wow, those really are super kewl beads!! I love how the backgrounds glitter, at least in the pics. I love all these beads and your creations are lovely! Love the earrings with the Round Rabbit Extras! Thanks for sharing... these are really unique! Mark my words, someday I will win something. And these would be just fine. Love your pieces! Would love to own some of these, thanks. I will have to check out Auntie's Beads as I love the look of those beads.